Finding Your Wedding Ring Inspiration to Showcase A Unique Love Story. Planning a wedding can be a huge task. Some experts say that you should start planning your wedding 10 months to 2 years advance! It may seem like the wedding dress and venue are some of the first things that you should get in order, but let’s not forget about your wedding bands. When it comes to wedding rings, it can be easy to ignore them until the last minute or put very little thought into shopping. 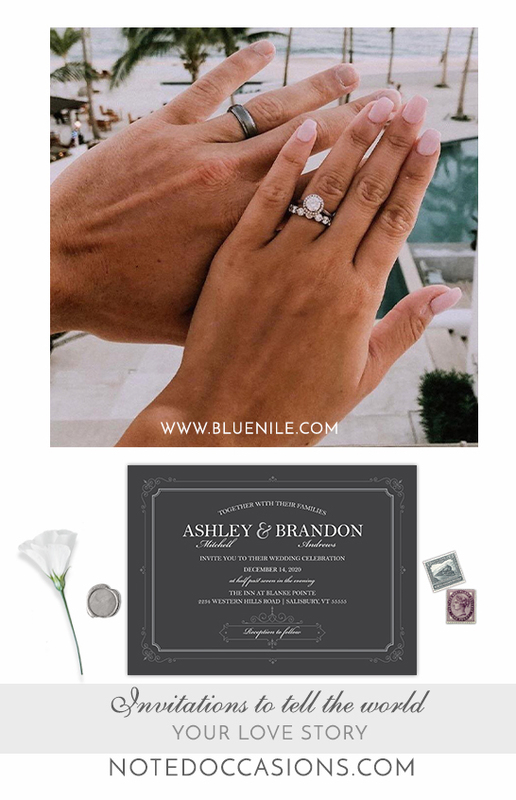 They represent your relationship so try to find something unique and meaningful and use your invitations as wedding ring inspiration! One of the first steps in planning is choosing your invitations to spread the news to your family and friends. Today, we’ve come up with some inspirations by coordinating wedding bands with wedding themes for you. These whimsically rustic invitations are perfect for a barn wedding! With the barn wood background and pretty blush peonies, you can use this as inspiration for your wedding ring and decor. A simply elegant platinum wedding band is perfect for the bride who chooses these invitations. Your platinum wedding band will be versatile so you can wear it everyday and remember the special day you married your best friend. These invitations are a must for any vintage themed wedding! The charcoal colors and vintage scrolling are perfect for any color combinations you can think of. A pavé wedding band is a gorgeous option for this invitation. The Art Deco style is decadent just like the pavé setting with diamonds all around the band. If you’re worried about fit or comfort then opt for a partial pavé setting. This option is a little more budget friendly with less stones. Attention, boho brides! You’re going to want to see these super-chic bohemian ideas! 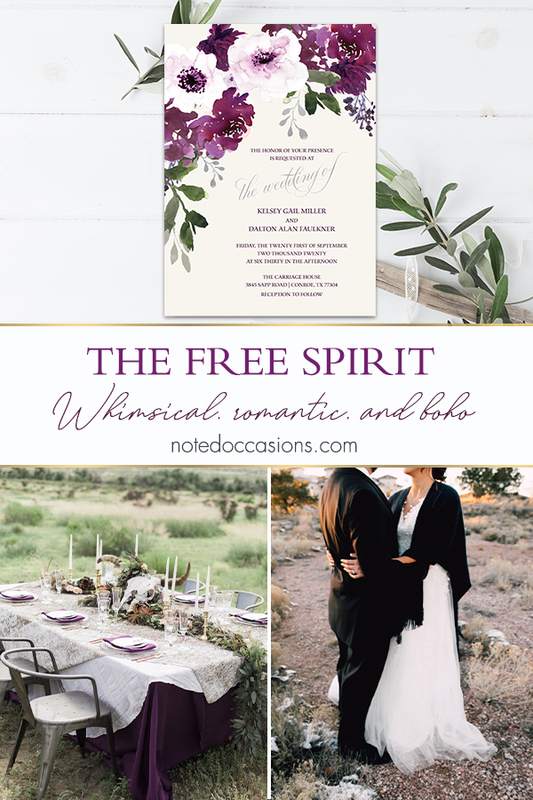 Boho weddings incorporate a mix of natural, rustic, and vintage details into the design.This dreamy invitation will do just that. 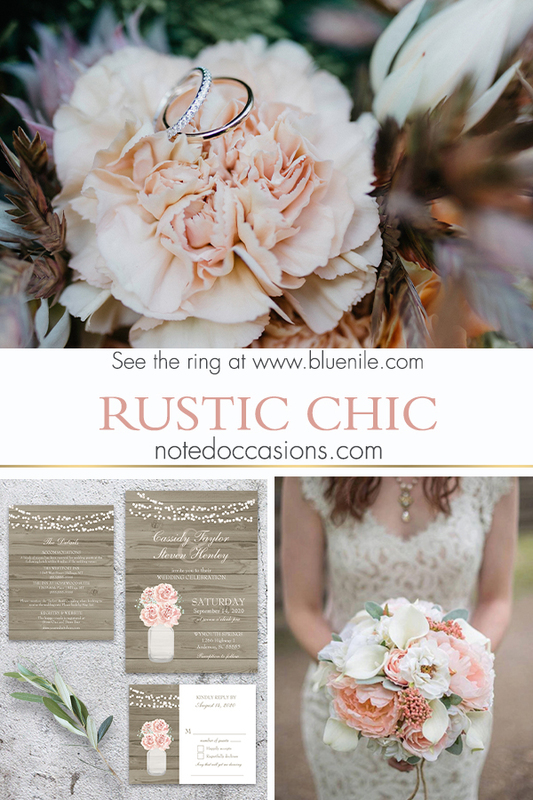 If you know you want to create your own wedding traditions, then check out these invitations. The watercolors are delicate and uniquely elegant. If you received an alternative stone engagement ring like amethyst, then you need a wedding band to match.To highlight your gemstone engagement ring, keep the band simple. A wedding band with small intricate details has its own style without overshadowing your engagement ring. Get inspired by the greenery on your invitation and get a wedding ring with vine like details. The outdoorsy couples will love these watercolor forest and mountains invitations. 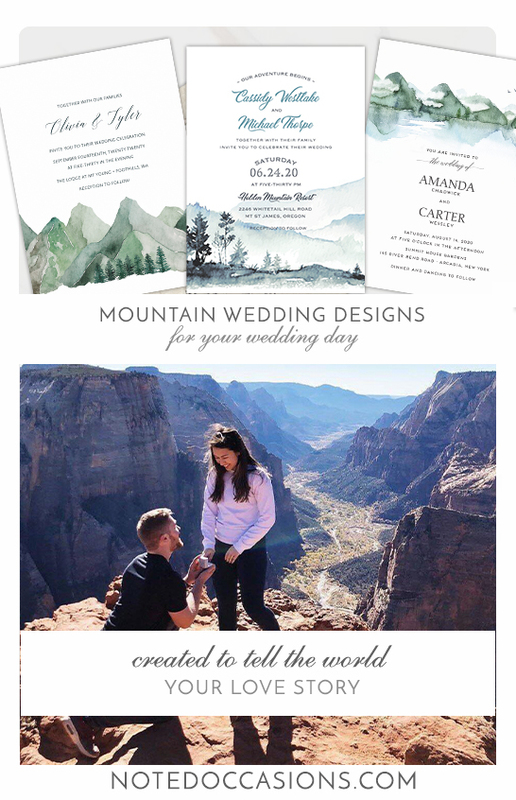 This is a great option for an outdoor wedding or to commemorate a mountain top proposal. With the invitations and floral decor, you can incorporate the beauty of the mountains and greenery even if your ceremony is in an indoor venue! When picking out a wedding ring, you’ll also want to consider your lifestyle. If you love to travel or have a physically demanding job then you should stay away from softer metals like gold. Titanium wedding bands are becoming extremely popular because of their durability and style. The unique metal is charcoal grey and so indestructible that the rings need a specialty jeweler for resizing. These classic invitations feature beautiful calligraphy and a vintage inspired wreath. They are the epitome of classic wedding elegance. You can even get your initials monogrammed for that ultra traditional look. If you’re looking to continue with wedding traditions, then go for a yellow gold wedding band. This metal is timeless for both wedding and engagement rings. You can’t go wrong with a yellow gold band, but beware of the upkeep! Gold is a softer metal so you may need to replace the metal plating in the future.